Indoor/Outdoor 7 Sided Poker Table! Enter For A Chance To Win A Free Storm Shelter! The Granger ISS continues to be the leading underground storm shelter innovation across America. Thousands of families have chosen the leading tornado shelter innovation by world class manufacturing leader and Rotational Molding industry leader, Granger Plastics Company, a division of Granger Industries. With nearly 20 years of expertise and industry leading underground shelter developments, research and patented products, it's no wonder that families, businesses, schools and more have selected the Granger ISS as their choice for underground storm and tornado safety. The Granger ISS Shelter is the only unit to feature double wall, 1/2" thick (each wall) polymer construction. Being constructied from innovative materials such as polyethylene, the Granger ISS leads the industry with the longest usable lifespan of any underground storm shelter. The Granger ISS Underground Storm Shelter is also the ONLY underground shelter manufactured by an Internationally recognized manufacturing leader. Granger Industries provides industry leading innovations and solutions to a wide variety of markets and industries ranging from Defense, Aerospace, Material handling, Bulk Storage, Chemical Processing & Manufacturing, OEM's and so much more. The only Tornado Shelter with a Safe Room/Panic Room quality door! See the NEW Granger ISS door exceed both FEMA 320 & FEMA 361 testing! See the multi-layer, storm shelter market leading door undergo not 1, yet (2) FEMA related debris impact tests, both FEMA 320 and FEMA 361 testing, with the SAME DOOR! Why don't other manufacturers upload their Texas Tech Debris Impact Videos? Perhaps the customers ought to ask that question! The Granger ISS is unquestionably, America's Leading Underground Storm Shelter! 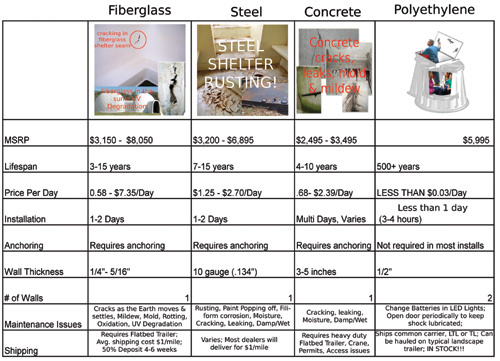 Fiberglass Shelter v.s. Polyethylene Shelter! 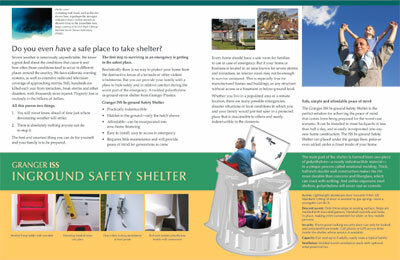 A MUST watch video for anyone considering purchasing a Tornado Shelter! Granger ISS Storm Shelter Customers on The News! Watch in the video clip above as the owner of one of Indiana's leading Manufactured Housing retailers tells a Terre Haute, IN news channel how the Granger ISS continues to bring Tornado and Storm Safety awareness to Indiana and provides his customers a safe place of refuge during inclement weather scenarios. See more Videos on Granger Plastics and Granger Industries on Granger Plastics YouTube Channel! Follow Granger Plastics on Twitter! Internationally recognized manufacturing leader, Granger Industries has corporate divisions that range from World renown Rotational Molding leader, Granger Plastics to Aerospace innovations with Granger Aerospace Products, America's leading Tornado & Storm Shelters with Granger ISS and Cemetery Vases and Burial Urns with ForeverSafe™ Memorial products, all divisons of Granger Industries, Inc. Copyright (c) 2013/2014 Illinois storm shelters. All rights reserved. Design by Granger Industries.